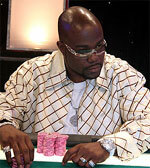 Paul Darden’s ultra cool hip-hop style has made him a favorite with World Poker Tour viewers. In addition to playing poker professionally, he is also a music promoter and night club owner in his home town of New Haven, Connecticut. Born to humble beginnings on October 27, 1968, Darden learned to play poker as a child in the back room of his father’s pool hall. As a teen, Paul had a brush with the law that changed his life when he was tried and acquitted of murder. Though innocent of the crime, it was a wake-up call which forced Darden to make the decision to do something productive with his life. During a trip to Atlantic City, Paul Darden met Phil Ivey and as the movie line says, it was “the beginning of a beautiful friendship.” Darden, eventually, entered a tournament and began making a name for himself as a Stud player. Then at the urging of Phil Ivey, who is also Darden’s coach, he learned to play No Limit Hold ‘em. Darden credits Ivey with seeing the potential of No Limit Hold ‘em long before most anyone else and helping him get in on the action. In 2003, Paul won the WPT Gold Rush tournament. In 2002, he won New England Poker Classic’s main event. In 2001, Paul won the WSOP $2,500 Seven-Card Stud event. His total live tournament winnings exceed $2,100,000.